This is the first in a series of occasional posts profiling people with regular day gigs who pursue their culinary passions after hours. This week, two Bay Area men who hold down demanding day jobs and craft high-end sweet treats in their down time. 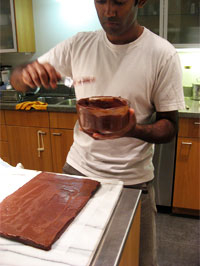 Meet Anand Chokkalingam, UC Berkeley professor by day and chocolatier by night. This cancer epidemiologist pursues his passion for high-end confections in his off hours and puts his scientific sensibilities to sweet use by hand-crafting artisanal chocolates with top-notch ingredients. He says the skills he brings to his day job — scientific rigor, preciseness, attention to detail — also stand him in good stead in his chocolate-making operation. Anand is a Sanskrit word that refers to a state of pure joy and divine bliss, which is an apt description of Anand Confections. Parlaying a fondness for making sweets into a chocolate following that started by word-of-mouth, Anand’s small-batch business got a boost last December when Town & Country paired one of his exotic candies with a tawny port. This writer discovered his inspired offerings at a recent bakesale benefit for Haiti. Anand enjoys playing with flavors from his Indian heritage, which give his concoctions their signature tastes, such as cardamom and saffron, and Darjeeling tea. 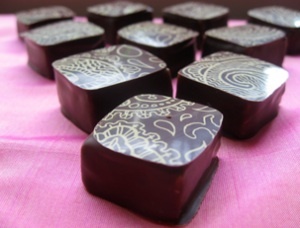 He cites legendary local chocolatiers Michael Recchiuti of San Francisco and Alice Medrich of Berkeley as early influences on his own creations. Anand, 37, concedes it’s tough to find extra time to devote to his nascent chocolate business. A father of two young children, early on his wife set ground rules around how many hours he could spend in the kitchen to protect both his health and family time. These included not working past 1 a.m. more than three times a month during high production times, such as in December’s busy holiday period, when he made some 5,000 pieces, each one cut by hand. They sold out. And it’s also a family affair: His youngest daughter is a taste tester; his school-age child likes to help in the production process. His wife helps with all aspects of the business. Family and friends lend a hand during peak production times. Sometimes, like prior to Valentine’s Day this year, traditionally a chocolate makers prime retail period, life and work intervened and scaling up production just wasn’t possible. Anand is mulling over what business model could work well with his current life. He’s toying with the idea of a chocolate club, similar to a wine club, shipping his tasty tidbits to subscribers every month or two. That way he could have some control over the hours he devotes to his chocolate obsession, experiment with new flavors, and continue to enjoy his craft. Currently his confections are available online. Read more about Anand in my Berkeley Bites column today over at Berkeleyside. During a routine business day Michael Winnike works long hours as a paralegal specializing in patent law for top San Francisco firm Fenwick and West. Off the clock, the 26-year-old churns out goat milk caramels under the Happy Goat label. These unique goodies with all natural ingredients were a big hit at the recent Fancy Food Show in San Francisco and can be found in upscale confectionery stores around the Bay Area and beyond. 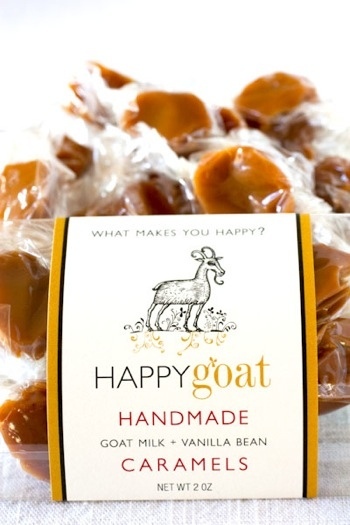 Happy Goat caramels are also available online. “I fell in love with goat milk as a confectionery ingredient. It elevates a simple treat into something more complex and savory,” says Michael, who lives in San Francisco’s Mission District and describes himself as the founder and chief executive goat of his fledgling business. Another self-taught sweet chef, he began focusing on his cooking hobby about three years ago after falling for a friend’s sheep milk truffles. He started gearing up on the goat milk caramel front about a year ago. Michael and his partner Kyle Pickering (he calls himself a strategy dork by day and director of marketing, media, and, ah, braaaaanding by later that day) have outsourced the making of their tangy treats to keep up with demand. But Michael still presides over the batches of bubbling caramel to ensure quality control. By year’s end he says he hopes the caramels will be available in 100 stores nationwide. Michael admits that being single and unencumbered helps with his second job, as he’s free to keep his own schedule with little time for extracurricular activities. It’s not uncommon for him to quit his “day job” around 10 p.m. and then work in the kitchen until 2 a.m. on Happy Goat business.